Facts Saddle Puffer Fish. "Scientific name for Saddle Puffer Fish is Canthigaster coronata". The Saddle Puffer Fish is a demersal type of sea fish that comes from the Tetraodontidae family. 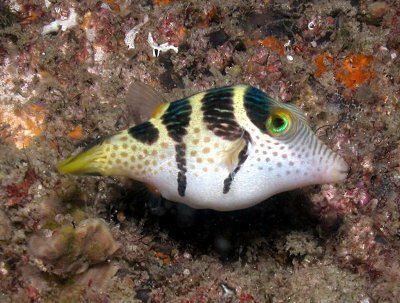 The Saddle Puffer Fish varieties are native to Indonesia, Hawaii and Sumatra, and are extensively distributed all through the tropical and subtropical waters, including the Red Sea and the Indian Ocean, and until the deep-sea islands of the Pacific Ocean. The Black Saddle Pufferfish breed is a nonviolent marine fish that attains a maximum body length of 4 inches (10 cm) when matured. The fish has four different black lines called saddles on its back part of the body. This is a bright and multicolored fish with dark tan bands across the midsection. The body of the fish is white in color, spotted with blue-grey marks, and their head is blue-grey in color. The teeth of the fish have a structure similar to a beak of a bird. Their fins and the tail show clues of yellow and there is a rainbow line of color at the back of their eyes. Some parts of the flesh of the fish are toxic and it has the skill, when alarmed or threatened, to blow up its body to approximately two times the normal size of its body. Usually, the fish turns out to be distressed when netted, so aquarists employ a container to shift it. Black Saddle Pufferfish breeds are omnivores, and they feed on invertebrates found in reefs in the wild. In the aquarium, they are fed with wide-ranging meaty foods, such as squid, clams, krill and hard shelled shrimp. They live in rock-strewn and coral reefs, ponds and outside reef at a depth of 180 feet (55 meters). The Saddle Puffer Fish breeds have a diurnal activity. They lack pelvic fins, but they learn to make use of their pectoral fins to travel in the aquarium. Usually, they prefer an aquarium with a minimum capacity of 50 gallons (190 liters), with the temperature of the water, ranging from 72 degree Fahrenheit to 78 degree Fahrenheit (22 to 25 cel), dKH 8-12, sg 1.020-1.025. Test the water when preparing your tank for your Saddle Puffer Fish: You will need to purchase a liquid tester so that you can test for Nitrates and Ammonia. The strip-style test kits are unreliable and a waste of money. You should use a dechlorinating product to remove the harmful chlorine from the water. Test for nitrite, ammonia, and proper pH between 8.1 and 8.4.. The ammonia should always be 0, the nitrite should be 0, and the nitrate should preferably be below 20 ppm. If it's at or above 40 parts per million (ppm), you have too many fish or are not changing the water often enough. Cycling your tank is important, Follow the steps to cycle your tank. This establishes healthy bacterial and chemical levels. The average lifespan of the Black Saddle Pufferfish breed ranges from 5 years to 8 years.